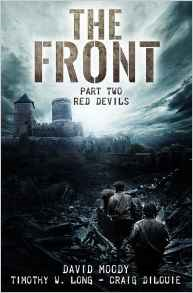 The Front: Red Devils is a book that I’ve been eagerly anticipating since I finished reading the previous book in the series, The Front: Screaming Eagles, and even more so when I realised who was writing it. I personally believe that David Moody is one of the best British writers of horror and zombie fiction working to date, and couldn’t think of someone more appropriate to be writing the story of British soldiers (and their American and German allies) waging a desperate and bloody campaign against a horde of undead rampaging across much of Western Europe. Following on immediately from where Screaming Eagles ended, the Siege of Bastogne has ended in a bloody defeat for the American defenders, who have been overwhelmed and then forced to retreat after a truly heroic defence against seemingly endless waves of the undead – a force composed of German soldiers, Belgian civilians and even a small but rapidly-growing number of American soldiers. Allied reinforcements are brought in to try and stabilise the front, including several British divisions, and the scene is now set for a titanic struggle of the living against the dead, as American and British soldiers try and come to grips with the reality of fighting a foe that is almost impossible to kill without a bullet or entrenching tool to the head; not to mention the terrifying realisation that being scratched or bitten by the living dead means coming back as one of them. Meanwhile, a small force of British soldiers is sent behind German lines to try and find the source of the plague causing the dead to rise again. Moody’s writing is up to his usual extremely high standard, and he very quickly creates a fantastically grim atmosphere that permeates the entire story and rapidly draws you into the narrative; before long you feel like you’re right next to the protagonists as they traverse the shattered ruins of Bastogne, or are desperately holding the tiny villages and snowy fields of the Ardennes against the undead horde. The tension gets ratcheted up superbly, and there’s a scene early on in the book that really stands out for me, as a stranded British paratrooper desperately races through what’s left of Bastogne in search of safety – weaving through crowds of corpses, running into the precariously balanced shells of buildings, clambering over walls and up drainpipes and ledges; I was genuinely holding my breath until the end of the scene, it had me that engrossed. The action scenes, which are plentiful in a book where hundreds, if not thousands, of the undead are present at any one moment, are extremely well-written, and if anything manage to surpass the high quality of those in Screaming Eagles. There are a number of scale engagements with plenty of brutal close-quarters combat, but what really shines are the chapters set in Polonezkoy Concentration Camp; it’s difficult to give any details without spoiling the story, but suffice to say that the writing, setting and atmosphere in these cjapters is top-notch. If anything, Mr Moody has managed to surpass the fantastic job that Timothy W Long did with Screaming Eagles, writing a book that has brilliant action scenes, a fantastic setting and atmosphere, and an exciting plot that ratchets up the tension until the last few scenes. This is a highly enjoyable series, and I am looking forward to reading the third book, Berlin or Bust! By Craig DiLouie when it is released later this year.